Team Brownie's Battenkill Prep Continues. On April 14, 2012, MV's Mike 'Brownie' Brown and Russ Emerson 'Fittipaldi' [not an authorized nickname] will team with Austin Bikes racers John Ashe, Cord Offermann and Kevin Schaefer to battle a 150 rider 40+ field at "America's Toughest 1-Day Race" - the Tour of the Battenkill. As part of their Battenkill preparations, Brownie and Emerson travelled to Louisiana today for the always difficult, 100+ mile Rouge Roubaix. The RR road race is perfect for Brownie and Emerson because its run over roads that are similar in condition to what they will face at Battenkill. According to Brownie, Rouge Roubaix "was the hardest race I have EVER done in my entire life [says the man who raced Battenkill two years ago]. Just to give you an idea there was one section where we had to get off our bikes and run up a hill that was so steep you couldn't ride up it!!! And that was at mile 86! Have you ever jumped off your bike and run 1/4 mile up a 20% grade after racing 86 miles over the absolutely worst paved and dirt roads ever created. Truly, truly epic. I finished 2nd and Russ finished 3rd. People were coming up to us after the race and telling us they have never seen two guys race so well as a team before. Just a great experience." 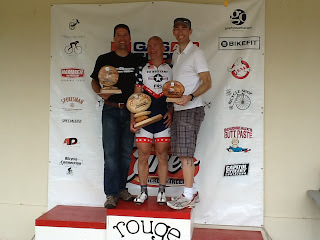 Brownie and Emerson's strong effort at Rouge Roubaix follows their strong showing two weeks ago at Texas racing's little taste of Belgium -- the Walburg road race. Both Russ and Brownie pulled double duty at Walburg. Russ started the Cat 3 race before offering tremendous support to MV's Masters team in the 40+ race. While Russ was racing with the 3s, Brownie was starting ... and finishing (24th) the 72 mile P/1/2 race. Brownie then bridged up MV's Tim Brandish in the the winning break before taking 2nd to the always strong John Korioth in the 40+ race that started right after the P/1/2 concluded. Just behind the winning break, the 'Seabass' Brad Price was leading out Smokin' Joe Howard for 5th overall. Another fine day for McKinney at Walburg. And a precursor of things to come for Brownie and Emerson at Rouge Roubaix... and perhaps at the Tour of the Battenkill too.